The School of Divinity at Yale University, in New Haven, Connecticut, is one of twelve graduate or professional schools within Yale University. Congregationalist theological education was the motivation at the founding of Yale, and the professional school has its roots in a Theological Department established in 1822. The school had maintained its own campus, faculty, and degree program since 1869, and it has become more ecumenical beginning in the mid-19th century. Since the 1970s, it has been affiliated with the Episcopal Berkeley Divinity School and has housed the Institute of Sacred Music, which offers separate degree programs. In July 2017, a two-year process of formal affiliation was completed, with the addition of Andover Newton Seminary joining the school. Theological education was the earliest academic purpose of Yale University. When Yale College was founded in 1701, it was as a college of religious training for Congregationalist ministers in Connecticut Colony, designated in its charter as a school "wherein Youth may be instructed in the Arts & Sciences who through the blessing of Almighty God may be fitted for Publick employment both in Church & Civil State." A professorship of divinity was established in 1746. In 1817, the occupant of the divinity chair, Eleazar Thompson Fitch, supported a student request to endow a theological curriculum, and five years later a separate Yale Theological Seminary was founded by the Yale Corporation. In the same motion, Second Great Awakening theologian Nathaniel William Taylor was appointed to become the first Dwight Professor of Didactic Theology. Taylor was considered the "central figure" in the school's founding, and he was joined in 1826 by Josiah Willard Gibbs, Sr., a scholar of sacred languages and lexicographer Chauncey A. Goodrich in 1839. 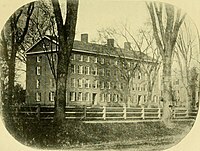 A dedicated student dormitory, Divinity College, was completed on the college's Old Campus in 1836, but the department had no permanent classrooms or offices until several years after the end of the American Civil War. Divinity Hall, occupied from 1870 to 1931, viewed from the New Haven Green. After a significant period of enrollment decline, the school began fundraising from alumni for new faculty and facilities. Divinity Hall was constructed on the present-day site of Grace Hopper College between 1869 and 1871, featuring two classroom wings and a chapel. Around the time of the new campus' construction came the arrival of new faculty, including James M. Hoppin, George Edward Day, George Park Fisher, and Leonard Bacon. The first Bachelor of Divinity (B.D.) was conferred in 1867, and the department became a separate School of Divinity in 1869. The school remained across from Old Campus until 1929, when a new campus was constructed on the northern edge of the university campus, at the top of Prospect Hill. Berkeley Divinity School affiliated with Yale Divinity School in 1971, and in the same year the university replaced the B.D. with a Master of Divinity program. While Berkeley retains its Episcopal Church connection, its students are admitted by and fully enrolled as members of Yale Divinity School. The Jonathan Edwards Center at Yale University, a division of the Divinity School, maintains a large collection of primary source materials about Jonathan Edwards, a 1720 Yale alumnus. The Yale Institute of Sacred Music (ISM) is jointly-affiliated with the Divinity School and School of Music. It offers programs in choral conducting, organ performance, voice, and church music studies, and in liturgical studies and religion and the arts. In May 2016, Andover Newton Theological School president Martin Copenhaver announced that Andover Newton would begin a process of formal affiliation with the Divinity School over the next two years. In the 2016–17 academic year, a cohort of faculty relocated to New Haven teaching students and launching pilot initiatives focused on congregational ministry education, while Andover Newton continued to operate in Massachusetts over the next two years. In July 2017, a formal affiliation was signed, resulting in smaller Andover Newton functioning as a unit within Yale Divinity School, similar to its arrangement with Berkeley. When the department was organized as a school in 1869, it was moved to a campus across from the northwest corner of the New Haven Green composed of East Divinity Hall (1869), Marquand Chapel (1871), West Divinity Hall (1871), and the Trowbridge Library (1881). The buildings, designed by Richard Morris Hunt, were demolished under the residential college plan and replaced by Calhoun College, now known as Grace Hopper College. In 1929, the trustees of the estate of lawyer John William Sterling agreed that a portion of his bequest to Yale would be used to build a new campus for the Divinity School. The Sterling Divinity Quadrangle, completed in 1932, is a Georgian-style complex built at the top of Prospect Hill. It was designed by Delano & Aldrich and modeled in part on the University of Virginia. A $49-million renovation of Sterling Divinity Quadrangle was completed in 2003. ^ "YDS at a Glance". Yale Divinity School. Retrieved 9 March 2014. ^ History of Higher Education Annual: 1997, p. 94 . ^ a b A General Catalogue of the Divinity School of Yale College: A Brief Biographical Record of Its Members in The First Half Century of Its Existence as A Distinct Department. New Haven: Tuttle, Morehouse, & Taylor. 1873. ^ a b c d e "Yale Divinity School Milestones, 1822-2012". Yale University Library. 23 October 2012. Retrieved 16 November 2015. ^ "YDS and Andover Newton sign historic agreement". Yale Divinity School. July 20, 2017. ^ "Raymond Benjamin Culver". 1937-1938 Obituary Record of Graduates of Yale University (PDF). Yale University. 1938. pp. 137–138. ^ "Faculty Members: Professor David Ford". University of Cambridge. 2011. Retrieved 23 May 2011. ^ Bernstein, Adam. "Ernest W. Lefever dies at 89; founder of conservative public policy organization", Los Angeles Times, July 31, 2009. Accessed August 3, 2009. This page was last edited on 24 January 2019, at 02:28 (UTC).